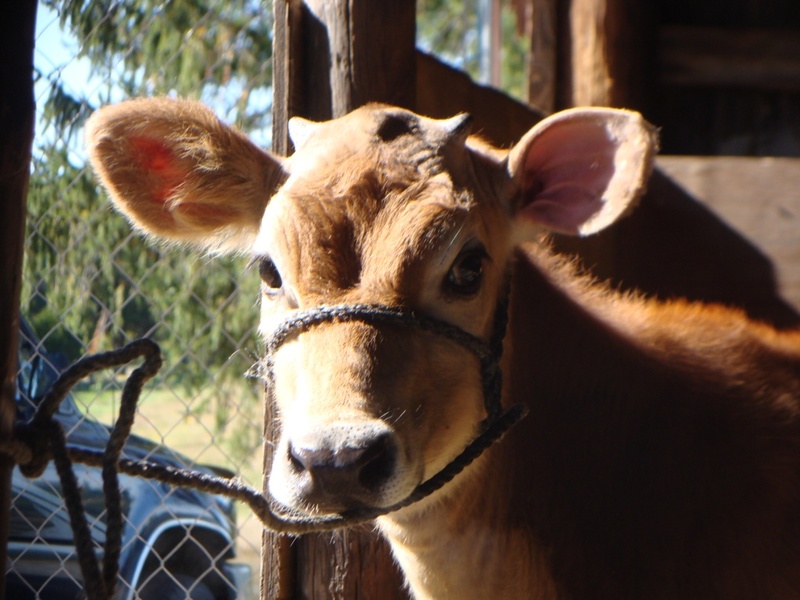 Most dairy breeds are born with horned. This means that around a month old, you will start feeling nubs on the top of your calf’s head. If left alone, the horn would keep developing. Most people find that dehorning a calf is easier than trying to work around horns and keep from being (accidentally or on purpose) gored. Burner: Various sizes. If you dehorn at a young age (around one month) you can omit gouging and use a smaller burner, like one used on goats. The burner in the picture is a larger one, intended for older calves. Clippers: To clip hair for a clean cut. Iodine or other sanitizing solution to keep gouge soaking in. 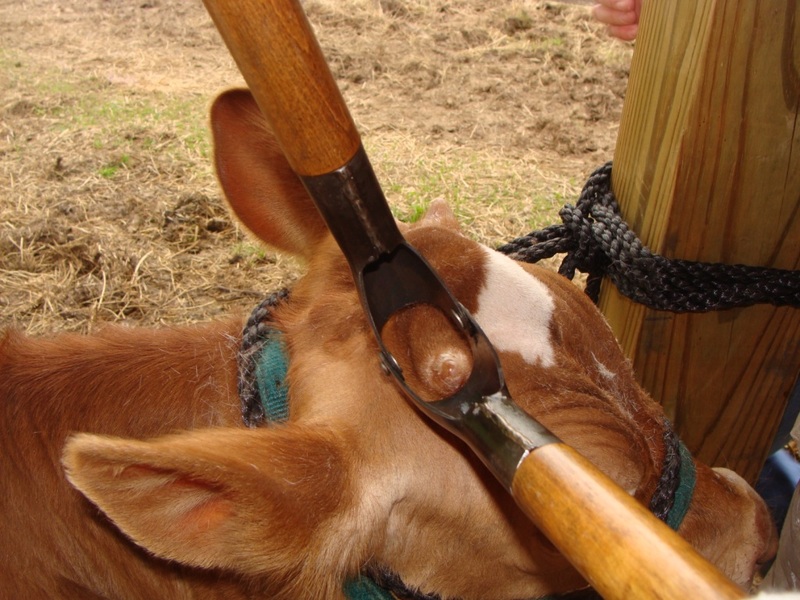 WE RECOMMEND YOU WATCH SOMEONE PERFORMING A DEHORNING BEFORE TRYING IT YOURSELF! Try to dehorn outside of fly season. If you have to dehorn when there are flies around, be sure to cover the wound with BluKote or a thick fly repellant salve and apply as frequently as necessary to keep the area free of flies and clean. 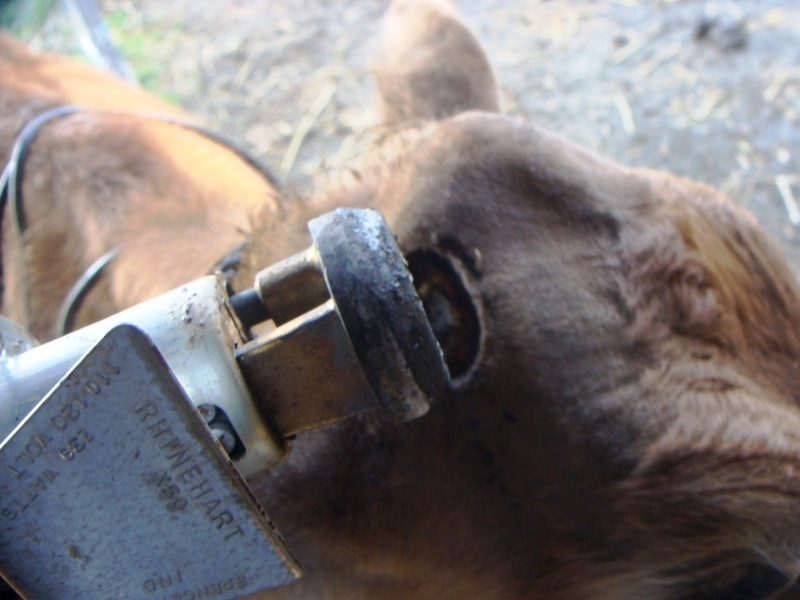 Do not dehorn in a clean area such as the milking stanchion. Cows are very sensitive to smells such as blood and burning. The lingering smells may frighten them and cause issues at the next milking. Plug in burner to pre-warm for a few minutes on a non-flammable surface in a safe area away from children (burner gets super hot and could cause a serious burn). Secure calf. 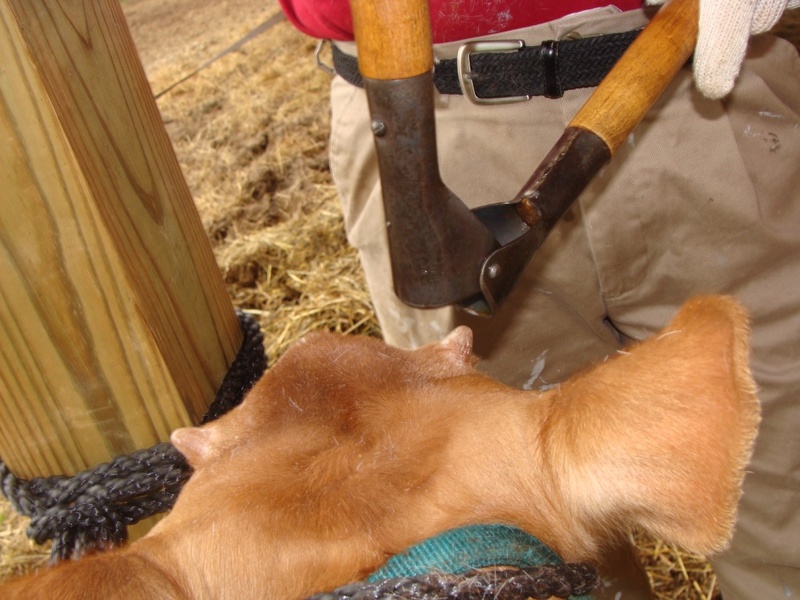 Have one person hold calf while other person performs dehorning. (If in stanchion, the second person can hold the equipment to hand to the person dehorning.) Clip around the nubs, try to get all the hairs around the horn. If you want, you can use a rag soaked in alcohol to scrub around horns. Be sure the gouge closes properly and is very sharp. You can open and close it in the iodine water to help get the iodine all over. Plus, moving the gouge will give you an idea how well it is working. Place gouge on head, just outside the band of horn and push down on gouge, causing the ends to come together and nip off the horn. The hole may bleed just a little, but will be mostly white. 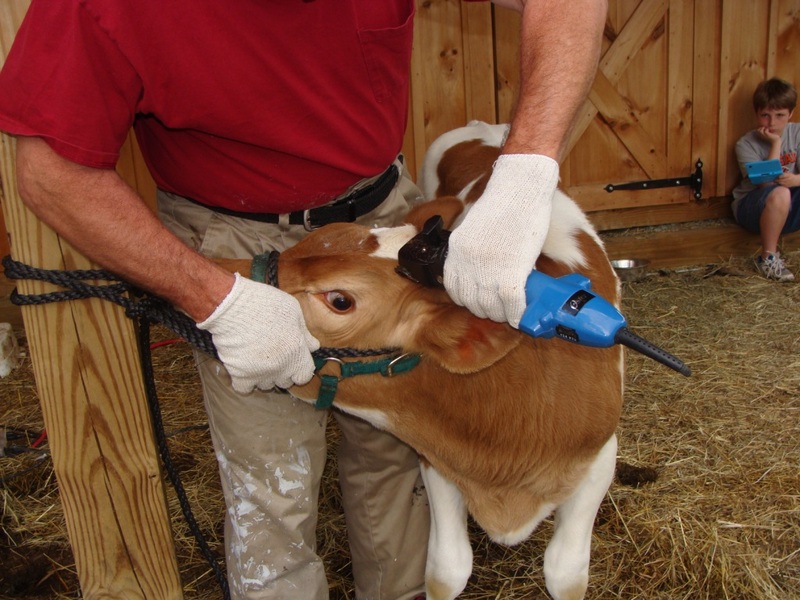 The calf may be upset for a few seconds, but it’s important to move onto cauterizing quickly to reduce pain as soon as possible. Immediately place burner on white portions, smoothly and evenly rotating the burner to dry out and stop any bleeding. When horn is sufficiently dry and cauterized, you are done. Tip: Try to avoid burning skin around area, especially near the ears. All done! 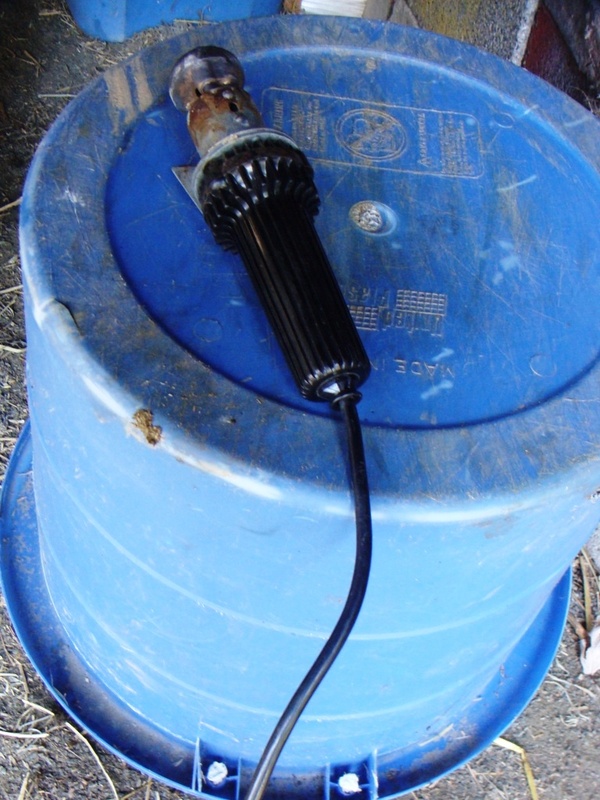 Let the calf rest for a few minutes while you unplug everything and clear away the equipment. Then let the calf go. Make sure they’re in an area where you can observe them and keep them close for a while. We’ve never had a problem, but better to be safe than sorry. All done and she’s eating already! A few months later, beautiful shape to head and no remnants of horns! TIP: A way to help quickly dry out the are after dehorning/burning is to sprinkle baby powder across the top of the calf’s head. In this case, Briar Rose got powdered after her dehorning (June 8, 2018) and we were amazed how quickly the area dried – no issues with flies! June 24, 2018 – Healing nicely. On her left, the scab fell off and that side healed over, but Jay had to pull the scab off her right side to allow that side to finish healing over. 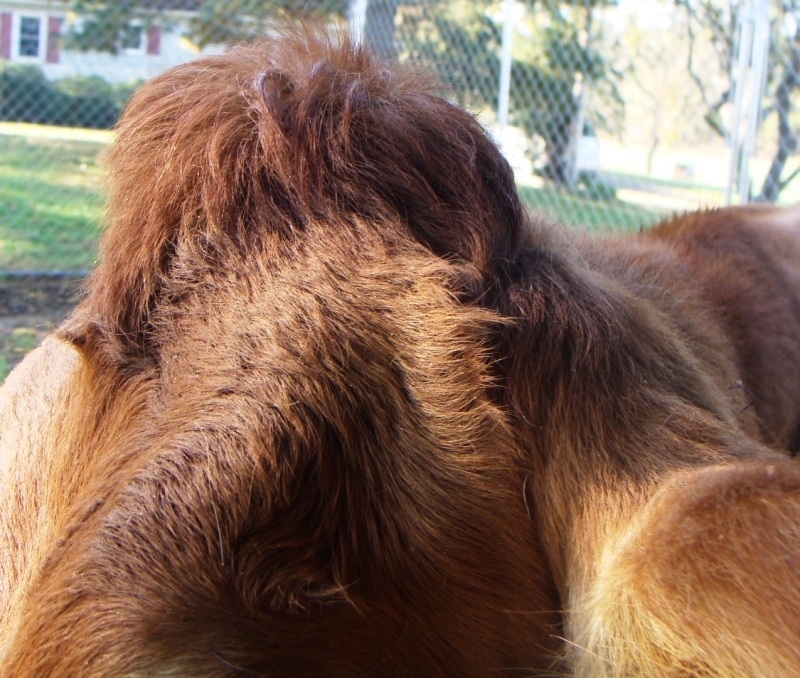 July 7, 2018 – One month after dehorning, her left side is completely healed and her right side is almost healed over. Note, flies were not a problem during her healing because the cut area was kept dry. 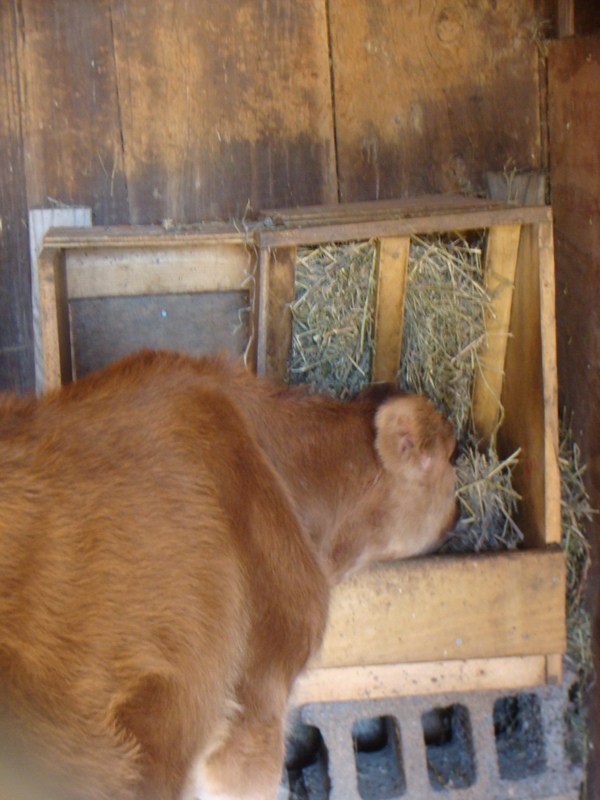 I have several cow friends who use the paste with good success….no scurs to date! What is your thoughts on paste? I’m lucky to have a husband that’s been doing the method (pictured above) his whole life, so convenient for me! We used to do a lot of showing and selling, so presentation of the animal is very important. We do the gouge/burn method because it 100% works, never scurs or regrowth. Secondly, it helps “shape” the head which is just a cosmetic (and definitely not primary!) reason.